Rajmohan Unnithan, UDF’s candidate for Kasargod constituency, feels that it is an uphill campaign with his 'outsider' tag in the are for the elections. 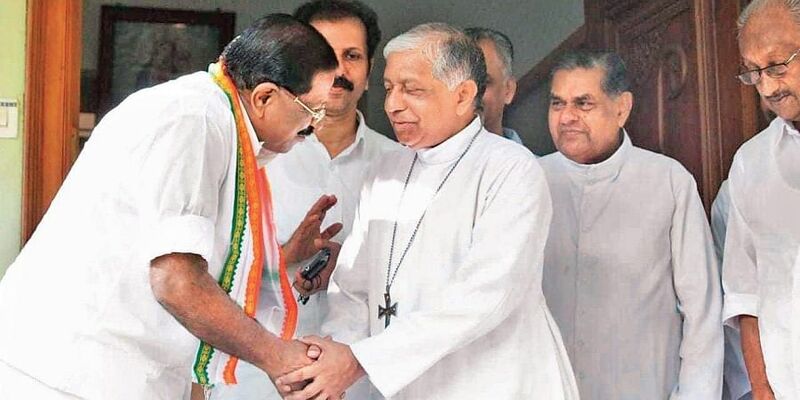 UDF candidate Rajmohan Unnithan calls on Kannur Latin Diocese Bishop Alex Joseph Vadakumthala on Monday. KOCHI: The Congress sprung a surprise when it named its spokesperson Rajmohan Unnithan as the UDF’s candidate in the Kasargod Lok Sabha constituency. He came in edging out local hopeful B Subbayya Rai whose USP was his access to the linguistic minorities - a traditional vote bank of the BJP. The party has placated him with a lot of public display of affection and by giving him centre stage in all events and key responsibilities. Q. Were you surprised by your candidature in Kasargod? A: In 2009, when Ramesh Chennithala was the KPCC president, he asked me to contest from Palakkad. I told him I was not interested in any place on the other side of Bharathapuzha. The reason? I was expecting to contest from Kollam where I grew up and worked. Later, Oommen Chandy and Chennithala offered me Thrissur. At the last minute, KP Dhanapalan was fielded from Chalakudy and I was edged out because of communal consideration. That year, three MLAs - K Sudhakaran, KC Venugopal and KV Thomas - were given tickets. In 2014 too, I was bypassed. This year, I knew I would be nominated as all the leaders such as Mukul Wasnik, Oommen Chandy, Ramesh Chennithala, Mullappally Ramachandran and K C Venugopal said I had struggled and worked for the party for long and deserved to be in Parliament. So I knew I would get a seat but contesting from Kasargod was a surprise. Q. How well do you know Kasargod? The rivals are billing you as an outsider. A: Every evening I am in everybody’s living room through television debates. People know and like me because of my way of talking and style of presentation. In fact, there is a wave in my favour even in CPM houses because of the stance I took on women entering Sabarimala. Q. How will you rate your rival and LDF’s candidate K P Satheesh Chandran? A: I will not speak or even think anything against Satheesh Chandran. This election is not about individuals. It is about CPM’s violent politics, political killings and how the LDF Government under the cover of the Supreme Court order tried to destroy the customs of Sabarimala. Q. The Congress said the candidature of K Muraleedharan in Vadakara will create a positive wave for all the UDF candidates in north Kerala. Will you stand to benefit considering you two have an acrimonious past? A. The LDF has fielded six MLAs in the fray. Hypothetically, if the six MLAs win, there will be byelections in six constituencies for which crores of rupees will have to be spent. This government is planning to take Rs 3,000 crore loan from the World Bank, the Treasury has been frozen, there was a man-made flood and we are thinking of rebuilding the state. This government has no money. The CPM knows very well there will be no byelection because all the MLAs would lose. It knows people’s emotions are against them after the murders in Kalliyot, Sabarimala issue, Ockhi and the man-made floods. If you see the Congress list put out by Mullappally and Chennithala, it is full of smart kids. In Kasargod, it’s me, K Sudhakaran in Kannur, Muraleedharan in Vadakkara, Raghavan in Kozhikode. Q. You and Muraleedharan were involved in an ugly public spat and name-calling. The old videos are being widely circulated in WhatsApp by rivals. A. Today, Muraleedharan and I enjoy a very good rapport. When I got the ticket, he congratulated me and asked me to schedule a campaign event for him in Kasargod. Now, he is a candidate and it may be difficult for him to come here. Yet, I believe he will come and campaign for me. As far as his prospects are concerned, he will register an effortless victory in Vadakara. Q. While introducing you to the constituency, Chennithala said in a lighter vein that Rajmohan Unnithan is a ‘paavam,’ all he has is a good heart, empty pocket and a tongue. Will that tongue come to bite you? A: In English, there is a saying let bygones be bygones. Everybody has a past. We have to be cautious in future. In my 50 years in politics, I have always had a clean image. The Marxists have nothing against me. Q. How will Kalliyot murders affect the elections? A: There were 22 political killings in the first 1,000 days of the LDF Government. Of that, the CPM workers are accused in 18 cases. But the murders of Kripesh and Sarath Lal in Kalliyot are painful. They have created a deep wound in the minds of the peace-loving people of the state. Every time, the Marxist party kills somebody, it will first deny it’s role and then hire lawyers for the accused. Q. Will the issue of violent politics overshadow Sabarimala? A: The LDF should brace itself for a backlash as all god-loving people are in the mood to take revenge. The BJP supporters are disappointed with the government and I am expecting them to vote for me to stop the CPM from winning. If they vote for the BJP, it might help the CPM romp home. If they are sincere to their slogans, they cannot allow the Marxist party to win. Q. Do you have any plans for Payyannur and Kaliassery considering these are Left bastions? A: In any election, the UDF is not able to get its supporters to vote. The polling percentage hovers around 45% to 50%. If we manage to get our voters to vote, we will win despite any number of bogus voting. Q. Your name always figures in rumours on Congress leaders joining the BJP. Your son too comes up with Facebook posts that apparently favour the BJP. Is the LS ticket from Kasargod an attempt of the party to pacify you? A: Even if CPM leaders Brinda and Prakash Karat join the BJP, I will be in the Congress. I’ve worked for the party for 50 years and will continue to do so. My son, 27, is not politically conscious. He cannot be with the BJP. He has clarified that in his Facebook post. His political preference is his prerogative. Kripesh was a Congress worker but his father is a communist. The father of slain IUML activist Arayil Shukkoor is a communist. Alphons Kannanthanam was introduced to electoral politics by Pinarayi Vijayan. But today he is with BJP. CPM veteran M M Lawrence’s grandson is now in BJP. My son is a techie in Chennai and he does not influence my political views.